ROME, OCTOBER 25, 2012 (Zenit.org).- Students of the Emmanuel School of Mission presented the following letter to Cardinal Stanisław Ryłko, president of the Pontifical Council for the Laity, with the request that he extend it to his fellow bishops and Cardinals who are taking part in the XIII Ordinary General Assembly of bishops for the New Evangelization. The letter was presented to Cardinal Ryłko last Friday after the Centro San Lorenzo’s opening Mass for the academic year, over which he presided. This message has been compiled by 18 young people from the ages of 18-31 representing the following countries: Australia, Czech Republic, France, Germany, Lithuania, Malaysia, Netherlands, Poland, Portugal, Slovakia, Slovenia and the United States of America. Although most of us were brought up in Catholic families, we can each testify that our personal relationship with Christ was radically changed through various means embracing the New Evangelisation. We wish to express our experiences of the New Evangelisation and, as young people, our perspective of the Church today. 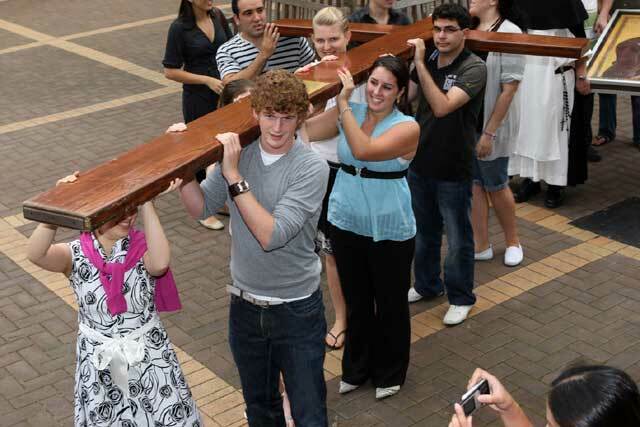 · Many young Catholics are indifferent towards their faith and evangelization. · Young people are seeking answers regarding sexuality and do not understand the answers of the Church; thus it is a barrier for their faith. · Relativism is a prevalent ideology among youth. · Many teens think of [the sacrament of] confirmation as ‘graduation’ from catechesis and they feel once they are confirmed the Church has nothing else to offer. · In some parishes we find it difficult to bring new people due to the lack of programs and welcoming of visitors. · Many young Catholics do not feel fully included within parish life, so they feel they must go to a community or movement outside their parish for formation and belonging. · Parish Priests sometimes are not open to New Evangelization projects. · There is little support or resources provided for evangelization projects for the youth. We would like to share some experiences that have aided us in our walk with Christ. We, as practicing Catholics, wish to embrace the New Evangelization and find that formation is extremely important for the mission of young people. We cannot evangelize unless we ourselves are evangelized. The opportunity to attend formation programs or courses on a weekly basis is of great aid; in France and the Netherlands, evening courses are run for young professionals to provide Christian teachings related to their daily life. The Church has a true treasure in the documents of the Theology of the Body, which can give answers to our questions about sexuality and provide important formation, helping young people grow in their faith and learn about who they were created to be. In Lithuania courses on sexuality based on Theology of the Body are offered to young people using secular terms and have had an impact on the youth. We would also like to express the importance of Catholic Chaplaincies within secular educational institutions. In these environments we need the support of others in the faith, as it is difficult to stand against the ideas of society and propagate the Gospel by oneself. The Sydney Archdiocese in Australia provides chaplaincies, run by lay people, priests and religious sisters, for university students. The students are active participants in the life of the chaplaincy; running Mission weeks, debates and study groups in which they can outreach to all students on campus. Although many young people are searching for the truth and seeking answers about their faith, many are not willing to enter churches for these answers. Therefore environments outside the Church are becoming new grounds for evangelization, giving the opportunity for young people to talk about the faith in a neutral environment without feeling confronted. For example, in the USA and Australia ‘Theology on Tap’ is a popular initiative, in which young people meet at a local pub and receive short talks from guest speakers, including cardinals and bishops. The presence of bishops and cardinals amongst us is a great encouragement, it helps us feel connected to the body of the church. Moreover, the presence of religious and lay people in the world who have a deep and personal relationship with Christ are a testimony to us. For many young people, joyful families living a concrete Christian life gives them hope for their own future, especially when many come from broken backgrounds and see so many separated families in society. Priests and religious are a visible sign for us of God in the world. In Germany, there are priests selected in each diocese to guide and help the youth. Young people need to see their sense of worth, they want to know their purpose in life and they want to use their gifts. Providing them an opportunity to use these gifts to serve the Parish, Diocese and Church is essential and will aid the propagation of faith and integrate them into the life of the Church. From our personal experiences of the Church, youth evangelizing youth is crucial. Young people are seeking answers for life. They desire peace, joy and love, and they are most willing to receive the message of the Gospel from other young people. It is therefore important that we, who are agents of evangelism, have the opportunity to be taught in the faith and, moreover, that there are true witnesses of the Gospel in our life, so we ourselves can become a witness for the world. These are just a few of the experiences amongst many which we have shared, in the hope that they might be useful and be developed, taken back to dioceses and used in aid for the evangelization of young people. We ask you to provide us the necessary means to evangelize so that more and more of us young people can become a witness to others. We need new ideas to live the love of Christ in our daily life. We hope and pray that you can give us this impulse and this support. We need your prayers; it is essential for evangelization. We need the Holy Spirit to place a desire for evangelization inside the hearts of the youth of the world and to open the hearts of those we speak to. The Students from the Emmanuel School of Mission in Rome 2012/2013.